Over the years we have received many questions from visitors that were either not completely covered by the FAQ or not addressed at all. In this section we will share those questions with our other visitors with the hope that you may find an answer here to anything that we have not already fully addressed. Please follow the links to find the full question and answers and also keep in mind that all of these answers are the opinions of the maintainer and do not constitute the advice of a medical professional. 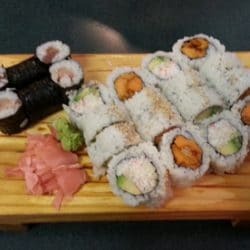 I’m a Sushi beginner and I keep reading conflicting reports about salmon and its health risks….is it ok to order salmon in a sushi restaurant? I understand that it may contain parasites. – Jason T.
Theoretically, salmon carries no greater health risk than any other fish that you may eat at a restaurant if it is inspected by a skilled sushi chef and treated properly during processing. There are two reasons that some people may feel that this is untrue, the first being that salmon spends some of it’s life in fresh water and therefore may be more prone to parasitic infection the other is that some may believe that it may contain higher amounts of contaminants than other fish. To address these issues (which may be overkill, but hopefully you will be interested Fish that live in fresh water are at much greater risk of parasites, but salt water fish contain many less. During it’s time spent in salt water, some fresh water parasites die off and are no longer present, however this does not mean that all will. Salmon to be served raw is also required by law to be frozen to extremely low temperatures to kill any parasites that may be present, so unless you are eating at a shady restaurant, you should be fine as the fish has been prepared properly (as long as the restaurant is not cutting corners and breaking the law). As for contaminants (mercury, flame retardants, pesticides), they tend to concentrate in the larger predatory fish, but unless you basically eat nothing but salmon three times a day for a year, you won’t eat enough to make any real difference. I would suggest not eating the skin, though, as contaminants tend to concentrate there (for that reason I stopped eating those yummy salmon skin rolls years ago, but I still eat tons of salmon and avocado maki). Salmon is actually quite a healthful fish as the Omega-3 fatty acids present are heart friendly fats. Wild salmon has much more of these fatty acids than farmed salmon, which unfortunately is much more commonly found at Japanese restaurants due to it being much cheaper. You can always ask and see if they have the wild variety, I always do for that reason. I was wondering if you could answer a question for me about making sure my fish is safe to eat raw. I bought it yesterday and I have kept it in my freezer since I bought it, and plan to let it thaw in my refrigerator over night tonight. Can I eat these fish raw? Is there any special way to tell if fish is safe or not safe for sushi? – Luke C.
That is correct. It is a United States (if that is where you live) legal requirement that all fish except tuna be ‘flash frozen’ to extremely low temperatures within hours of being caught. This not only helps preserve the fish during the fishing boat’s remaining time at sea, but also serves to kill parasites that would otherwise be harmful when the fish is ingested. So this practice is especially important with fish that will be eaten raw. N.B. For detailed information about the freezing requirements of sushi grade fish, please visit our What is Sushi Grade Fish page. I purchased some sushi and it is more than I can eat. Can I freeze the remainder or must I discard? How long does it keep its freshness? – Tom H.
Generally speaking, sushi does not freeze well, so you will not appreciate leftover sushi very much. Cooked rice and nori (seaweed) both may become quite unappetizing when thawed. Not unsafe, but not appealing (so that choice is yours). Sushi will keep in the fridge for a little while, but overnight I would discard, personally. Remember that the fish is raw and any contamination that may be at low (and safe) levels when purchased, may get to unsafe levels over time. I will usually refrigerate my leftovers for up to 10 hours, but I discard after that just to be safe. You definitely don’t want to get sick from seafood that is too old. I was told long ago that although sushi fish has not been cooked, instead it’s taken to an extreme “Below Zero” temperature to kill any harmful organisms. I cannot find anything to verify that. Any thoughts? – Susan G.
Real wasabi has less than 1 milligram of sodium per 4oz serving, which is effectively zero. The ‘fake’ wasabi that is served usually instead of the real item however has around 100mg of sodium per serving, significantly more than the real deal. If your sushi place has the real item, I would ask for that if you are really reducing sodium, although 100mg is still not a huge amount, it may still be more than you are looking for. You are correct about soy sauce and miso having high sodium contents. I have being trying to make sushi at home for quite some time, and over the last while, I have started to notice the different cuts of salmon that you can get. The problem I seem to have is that I always buy salmon fillets from a fishmonger in our area, and although it is a lot cheaper than buying the fish from a sushi bar, it doesn’t seem to cut or shape as well as the fish I buy from the sushi bar. Am I correct in saying that there are 2 main cuts of salmon, fillet and halfside? The fillet I find seems to break up very easily, where as “halfside” is more of a solid piece of fish, that seems to handle easier – not break up – and can be shaped easier. I.E. for sashimi and cutting slices for salmon roses. Is that correct? Also is “half side” the correct word for that piece of fish I am referring to? – Jason B. You are correct. The thicker portion of the entire fillet is referred to as a ‘half side’ and is generally easier to work with for sushi and sashimi. However the area closer to the belly (the fattiest part) may fall apart easily and is often trimmed and used for other purposes (maki, roasting, etc). Another thing to keep I mind is that the older a piece of salmon is, the ‘looser’ the flesh will be and the more likely to fall apart. I don’t intend to disparage your local fishmonger by that remark, but keep in mind that since they usually expect you to cook the fish, it may be a day or a few days older than what you are served in a sushi bar and therefore more likely to fall apart as the natural autolytic reactions that occur in meat will cause it to degrade with time. Look to see how loose the flesh seems and if it seems to be loose around the connective tissue, it will have a tough time staying together when you cut it into smaller pieces. You can always ask your fishmonger to get you some from the back (e.g. ‘fresher’) if you are comfortable with asking that and tell him/her that you intend to use it for sushi. They may even have specifically ‘sushi grade’ salmon for you, you never know. I actually buy my fish from a Japanese grocer near me and they have sushi grade fish specifically for sale. It’s more expensive than going to the local fishmonger, but certainly less than buying it at a restaurant to take home. Of course, that may not be an option for you I understand. I am a sashimi addict but just learned I am allergic to soy… Do you have any advice or do you know of any product that tastes similar to soy sauce, minus the soy? – Brett G.
I have also heard of people replacing soy sauce with Worcestershire sauce, which is becoming more popular in China due to their supposed similarities. I’m not personally sure just how similar they are (I like them both, but I’ve never thought to try a similarity test). Worcestershire sauce is actually based on the Vietnamese ‘nuoc man’ which is fish based (Worcestershire sauce has fish, sardine I believe, as an ingredient), so theoretically I could see how it might go with sushi. The predominant property of soy sauce is it’s saltiness, but it also adds a depth of flavor, a meatiness known as umami to foods. Worcestershire sauce may actually do the same, so who knows…. I have never tried to use it as a replacement for soy sauce, but since some folks around the world do, hey… you never know! I’d be curious to hear what you think. Other than that, I’m sorry, I can’t think of anything else that has ever come up as a replacement. There are actually other ‘flavorings’ such a product called Maagi (which can be hard to find in the US) that are yeast based (a natural source of MSG) that might do the trick, but they are much stronger in flavor so should be used sparingly. I put it in/on meats, eggs, and almost every stir fry that I make and it’s a excellent product and definitely adds a tremendous depth of umami flavor to a dish. There is also a product called “Coconut Aminos” that can be found in some health food stores (or grocery stores that carry a greater variety of items) that I have been told is incredibly similar to soy sauce, so much so that the taste and experience are the same. While I have never personally tried it (I need to find some) the basic idea of the amino acids sounds like it would provide the same umami taste sensation as soy sauce, and if is has a fair amount of salt, I could certainly see it being very similar. If anyone has tried it (Other than my favorite reader Julia G.) and can attest to the similarities, I would love to hear of their experience. I recently had a waitress at a Chinese restaurant tell me that sushi is loaded with MSG? Tell me it’s not true!!! (But only if it isn’t true.) My daughter suffers from migraines that are triggered by MSG, and now she’s sure she shouldn’t eat sushi anymore. – Sally L.
True, classic sushi should have absolutely *no* MSG in it. It is made up of nothing but clean, fresh, fish, rice with seasonings (vinegar & either mirin (which is a sweet cooking sake) or sugar for that touch of sweetness, and seaweed (as a wrap for rolls). Other than what is visible, the only ‘unseen’ additives are the vinegar and mirin. It is always possible that some lower quality, so to speak, places may try to enhance flavor with MSG, but I have never encountered it, or even heard of it. The Chinese are particularly known for using MSG in dishes, and some Chinese food restaurants are now serving sushi as well and you might want to ask the waitress or sushi chef specifically if they do this if you suspect they might, but again, I have never heard of this happening. There are other dishes served at both Chinese and Japanese restaurants that *may* have MSG in them (particularly Chinese restaurants which add MSG to many of their cooked dishes) and you might want to ask about those, but the sushi and sashimi should be safe for your daughter from my experience. You should never be afraid to ask the wait staff, however, you are their customer and have a right to know anything about the food you buy from them. Try the tactic my brother uses, since he does not eat dairy, and tell them that she is allergic to MSG and needs to know if the dish she ordered contains it. They don’t want a lawsuit and should certainly tell you. Here’s a great follow-up to this question from reader Alex Stewart. He writes: Good quality sushi should not have any MSG added to it, but the question of whether it _contains_ MSG is a bit more fuzzy. This is because one of the traditional components in many recipes for sushizu (the sushi vinegar mixture) is konbu (kelp, often used for soup stocks and such in Japanese cooking). One of the main things that konbu contributes to any recipe, in addition to vitamins and flavor, is glutamic acid (which occurs naturally in many forms of seaweed). Now, glutamic acid is really exactly the same chemical as the “glutamate” in monosodium glutamate (in fact, the first forms of MSG were created by Japanese researchers by extracting it from konbu). Since sushizu recipes also typically include some amount of salt (sodium) as well, the resulting mixture actually has sodium and glutamate ions floating around in it. It turns out that chemically, this is exactly the same result you get any time you add commercial MSG to anything containing water (i.e. food). So in effect, many sushizu mixtures contain “natural MSG” as a result of this process. It should be noted, however, that this sort of “natural MSG” also shows up in a bunch of other foods which most people eat all the time, including tomatoes and asparagus, and you’d certainly find far more of it in a slice of tomato than probably an entire meal of sushi, so if you don’t have problems with those sorts of foods, the konbu in sushi presumably shouldn’t be an issue either. To further complicate the question, however, there are a large number of pre-made “sushi powder” mixes, which can be added directly to rice instead of making up actual sushizu, to give it the same flavor and consistency. Most if not all of these powders, being mass-produced as cheaply as possible, actually emulate the effect of konbu by just adding industrial MSG to the formula instead, and if you look at the ingredients list on a packet it will actually say “monosodium glutamate” in there. I don’t actually know how common it is for restaurants to use these powders (I’ve mostly seen them sold for home use), but I wouldn’t be surprised if at least some of the lower-quality establishments buy and use something like that for cost and efficiency reasons. All this having been said, it is important to point out that even though some sushi may have forms of MSG in it, that’s not necessarily the same thing as being “loaded with it”. One also needs to take a look at exactly how much of it there is in any given piece of sushi. The sushizu mixture in sushi is actually a fairly small portion of the total (generally about half to 1 tablespoon per cup of cooked rice), and of that, the “MSG-like” components are a fairly small portion of the sushizu mixture as well (maybe (at most) half a teaspoon per cup of sushizu, and that’s being generous). What this comes out to is somewhere on the order of 1/32 of a teaspoon (or less) per cup of sushi rice, or around 1/150 or 1/200 of a teaspoon per piece of sushi. 1/150 of a teaspoon! (And that’s the generous estimate. Odds are it’s a lot smaller for most sushi.) So to sum up, traditionally-made sushi may have naturally-occurring sodium and glutamates in it, which is equivalent to MSG, but probably isn’t a problem for most people with MSG allergies. Lower-quality sushi may also be made with sushi powders which almost always have MSG added to them, but in all sushi, the amount of “MSG-like” stuff is actually a very very small part of the whole recipe anyway. My general recommendation is if you’re still concerned about such things, stick with higher-quality sushi establishments, ask them whether they use MSG or konbu in their sushi mixtures, and try it carefully and see whether you have a problem with it before deciding whether to continue eating at a given establishment. But to be honest, I really wouldn’t worry about it too much. Thanks Alex! Can sushi rice be cooked the day before making sushi? – Kirsty K.
The answer depends on the nature of your question. To answer in one way, it can, but any food left out for more than a few hours is subject to going bad due to contamination. Unless you can carefully control all variables, and know the proper amount of acidification, etc, I’d be really careful of any food left out for long. Personally, I don’t do that. I’ve heard of some restaurants that make their sushi rice well ahead of time, but they are required to follow the HACCP requirements set by law, which ensures their rice won’t cause illness. If you mean cook it and put it in the refrigerator, the end result will be dry and not work well for sushi, so I would recommend you not do that, you won’t be happy with the results as it won’t stick have the proper consistency to sushi making.